This was the inspiration picture that my client had for her dining room.... beautiful! Here is her dining room now, with the finished parson chair covers, new modern light fixture and bamboo shades replaced her previous swag window treatments. She had been holding onto the damask fabric for a few years and found the blue chenille textured menswear looking fabric on clearance at Joanns. It was amazingly soft! 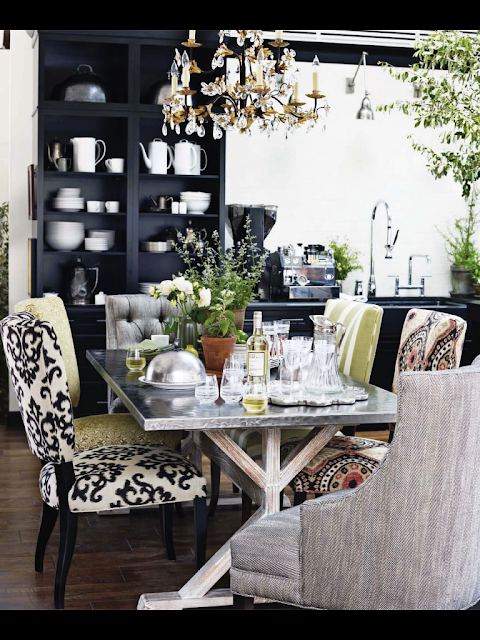 I love the eclectic look of all the fabrics, and the boldness of the damask print. In this setting the damask has a different vibe than it normally does...Funky and bold! She has had her table for 20 years! She said she's painted it with every trend including the crackle paint....love that it's black and the chair legs are brown wood. I love mixing woods, metals, and different finishes. I don't like when things are super matchy...you know bed-in-a-bag doesn't work for me. I don't want my comforter to match my shams,curtains, bedskirt, and lamp shades. I loved the texture of the blue fabric...I could pet it for hours! I did have to do zippers down the right outside back...the chairs tapered in toward the bottom, and the slipcovers wouldn't be able to come off without zippers. I also made sure all the repeats in the black damask were in the same spot on the inside back/outside back/seat. To do this I put a pin in the chair I was fitting on the center backs and center seat and centered the pattern over that pin each time. Also the blue had a nap (color looks different if upside down) to it. The standard is to pet the fabric down, so when you slide/get off the chair's seat you want the nap to be brushing down. Then make sure the nap is running down on the rest of the chair. Great job again. You are so right how the damask looks completely modern with the chair style and other fabrics. These looks great! I love the fabric choices. Great job! Amazing pictures and great information. I love those intricate designs and how all the things were put together. I hope you will share more great stuff here as it helps to everyone specially who love designs.